Yes, but the meaning of “vacation” varies. For some, a vacation means a trip to relatives in another settlement or attending an out-of-state wedding. But also popular are more traditional vacation destinations of natural beauty or historical interest. 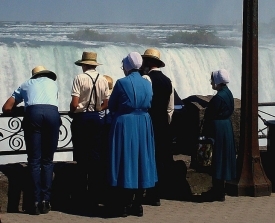 Today we have a look at one Amish family’s vacation from the perspective of Rebecca Miller. I hope you enjoy Rebecca’s account of her family’s trip to Niagara Falls and the activities and experiences they enjoyed. Dear readers, this is a brief introduction to a series of stories I am writing of trips I have taken. As a young girl growing up we seldom went on family trips or vacations, mainly because of the expense. Still we did not feel deprived. Our parents took us places like the zoo or other day trips and I have many special childhood memories of just working and playing together. 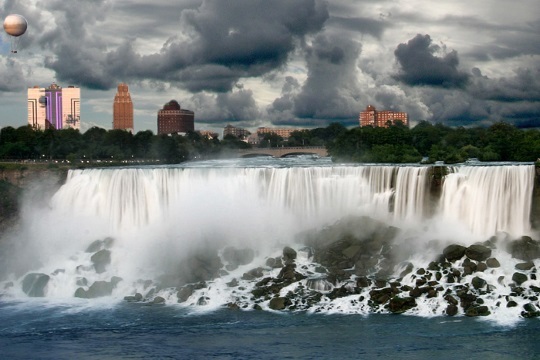 My first story will be about a trip to Niagara Falls which we took as a family when I was 19. It’s actually the first family trip we took that was more than a day trip, except for several taken to visit relatives. At 7:30 this morning, Larry and Pat picked us up. We were quite an excited bunch of children from us older ones all the way down to little Lori. We stopped at Bob Evans in Burbank for breakfast. Then we toured the Red Cross headquarters in Cleveland and visited David Plate’s (Red Cross CEO) office to bring him the raspberry pie Mom made for him yesterday. He gave me some old school books (his wife is a public school principal). They’re not really what we use, but it’s the thought that counts. Then Dad, Mom, and us older 2 girls donated platelets. Then we were off again, with a stop at a travel plaza for supper. There was a covered walkway across the highway and we would watch traffic and wave at the people and they would wave back or honk their horns. The younger ones thought this was a lot of fun! Meanwhile Dad and Larrys were making reservations for a hotel and tours for tomorrow. We saw the lakes and a beautiful sunset over the water. Awesome! We can see the mist from the falls, although we’re staying 10 miles away. Our motel is a bit frumpy and dirty. But we’re all so excited for tomorrow – we don’t care. This morning we boarded Bedore Tours bus to go see some of the sights. We had a very interesting tour guide. He was funny and kept things lively. First we toured the Robert Moses Power plant. It was very interesting to learn how they generate the electricity. Then we finally got our first view of the Falls. WOW! That’s all I can say. I’ve never seen anything like it. I could just stand there and watch the water for hours. There is just something so mesmerizing and yet soothing about watching those torrents of water rushing to who knows where. We rode the Maid of the Mist. It was really cool to be so close to the Falls. Then we went to Cave of the Winds. We got chilly and wet, but is was well worth it. We could go right up to where the water hit us coming down. We then enjoyed a late lunch at a KFC. This PM we went to the aquarium. We saw many interesting fish and watched a sea lion show. Then we walked out to the observation deck between Rainbow and Bridal Veil falls. It is so beautiful here! We enjoyed ice cream cones, then headed back to the van. We were all tired and wet, but it was surely worth it. The view was just awesome ! We are staying at Fallsview Inn tonight- much nicer than last night’s accommodations. We started our morning with a hearty breakfast at a German restaurant. Then we walked to Marine Land and spent quite a while there. it was quite a walk, too. We ended up piggy-backing Lori for awhile. Good thing she’s a light girl. We watched the dolphins, sea lions, and killer whales perform. The older three of us girls took a ride on the Sky Screamer. It’s 450 feet tall and you rise and drop rapidly. You can almost feel your stomach drop out. The others rode some of the smaller rides. We had pizza for supper. We had a tour from 6:45-11:00. They took us to the Gardens, the floral clock, and a monument. We also stopped at a souvenir shop, saw the Whirlpool rapids and Journey Behind the Falls. Then we watched the fireworks over the Falls and saw the colored lights come on. Then we went up the Skylon Tower for a view from the top. It was a great evening! We had a very kind, thoughtful guide and friendly people to travel with on our tour for which we were thankful. We ate a buffet breakfast at a small place and sat out on the patio. We walked down to the Falls and took the bus to the Aero Car. We all took rides, we also visited the Hershey’s store and went up the Skylon again to see the views in the daytime. By mid-afternoon we started home. We were all tired and warm. We children all fell asleep while we were stuck in traffic across the bridge from Canada to the USA while waiting in the customs line. We stopped at Lockport Locks, a small locks in the Erie Canal for river barges,about twenty miles from the Falls. We toured the caves and had an underground boat ride. It was interesting, but we were all ready to head home. We got home about 12:30 AM. We had a very worthwhile and interesting vacation! But Holmes Sweet Holmes sure looks good. My grandmother on my father’s side grew up on a farm not far from the falls, New York side. (I’m over sixty, my dad was forty when he had me, he was a change-of-life baby — call it 150 years, not too far off.) A great day out for her was when she accompanied her father on the flatbed wagon down to the pools at the bottom of the falls, where he would pitchfork up fish stunned in the falling. No, they didn’t eat the sturgeon and the like themselves. Those went from the wagon bed straight to the hogs. Poor in things, Grandma Flora’s family may have been, but as I look back and try to imagine it, the world around them seems rich. I will be in Niagara Falls for 4 days next week but don’t know if I will actually visit the falls. I may walk down one evening after the conference is over for the day. However I also remember my first visit to the falls about 55 years ago as a school age child. No subsequent visit can compare with the first visit to a site like the Falls. Thanks for sharing, Rebecca. What a neat first vacation! My parents went to Niagara Falls on their honeymoon. Years later, we went there on a family trip. Your descriptions of the Falls are spot on with their natural beauty. This brought back memories of my husband’s and my trip to the falls before we had kids. I,too, was mesmerized! To think how some areas of our country are s odry they’re burning, then to see all that volume of water going over the falls, almost endlessly—it truly makes you think! I know it’s changed quite a bit since then (early to mid 1970’s), more crowded from what I hear. Rebecca, you mentioned “a very kind, thoughtful guide and friendly people to travel with on our tour” for which you were thankful. It almost seems to indicate you’ve had some bad experiences at some time with guides or fellow travelers. Care to elaborate? Just curious. Alice mary, No, not necessarily- remember this was my first experience that far from home and that was what I had written in my journal 11 years ago. These folks were just extra nice, beyond the call of duty, we had alot of great experiences on that trip ! That sounded like a great little vacation. Now I want to see Niagara in person. Thank you, Rebecca. If you’ve never seen it – you need to. it’s awesome ! But it is very commercialized. Is there a way of connecting with a commenter? Haven’t seen him on here lately. I was hoping to engage him, off the site, maybe? From what I understand, the commenter who goes by Jonathan Edwards wishes to remain anonymous, so unfortunately I won’t be able to connect you. He is free to leave a contact for you here though, or vice versa. Do we know if he is well? Or has he been around and I just missed him somehow? What about Mark from Holmes County? I miss hearing from Mark too. Maybe he has been busy. Hi Rebecca, I was just wondering what it’s like when you go on vacation to an area where the people are unfamiliar with your style of clothing, etc. Do folks make comments or stare? Or do you generally find people to be friendly and maybe just want to talk and find out more about you? Do you welcome their interest or would you rather be left alone to enjoy your travels? I work in a school with special needs children and we’ve encountered all sorts of folks when we go out into the community – some people are very accommodating and friendly and others are unbelievably rude. Just wondering what kinds of experiences you’ve had.